There's been some tension in my relationship with Oliver lately. It concerns his new disdain for curfew. A few weeks ago, he decided he's not interested in being locked up on the back porch for the night anymore, so he stopped coming in. I would go find him and haul him in, but then he started hiding and running from me. He was clearly communicating that he wanted to stay out all night and protect the territory. I can't sleep when I hear the sound of cats fighting, especially when I know it's my Oliver. There have been a number nights over these weeks where I've not been able to haul him in, and he fights, fights, and fights... I wore ear plugs to bed those nights, so I didn't hear it, but come morning, his body had many cuts and scratches from the battling. So, with this tension between us, I thought maybe a father-cat bonding experience might help. 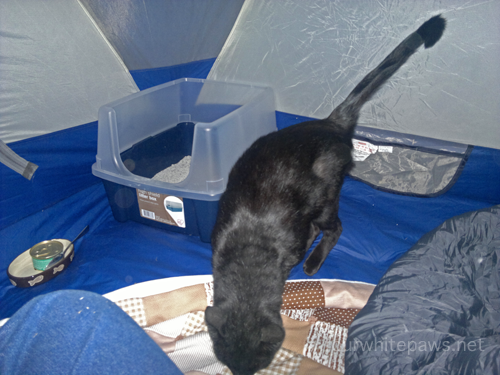 With it being a beautiful evening and a full moon, I thought what better than a camping trip with my Oliver! 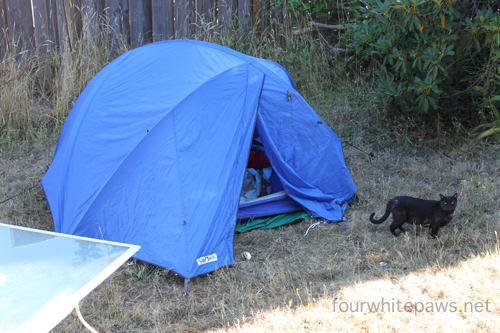 The tent is setup in Oliver's yard. 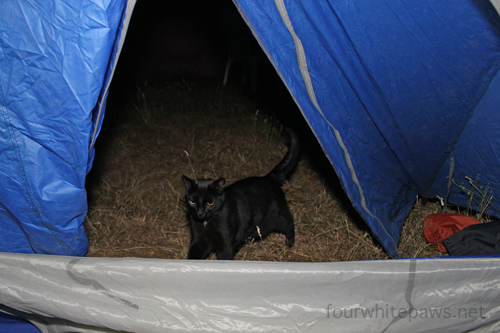 After setting up the tent, I looked all over for Oliver but he was no where to be found! Brat! 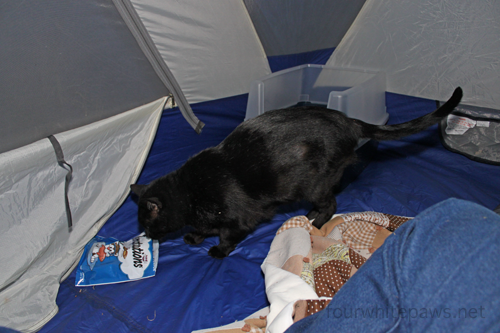 Everyone knows that camping is not camping without special yummies! I think Oliver purred all night! He so LOVES to cuddle, we cuddled nearly the entire night. 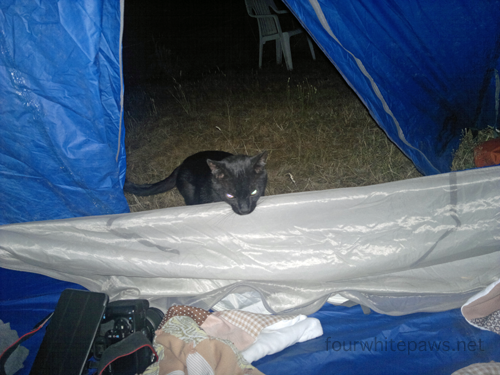 However, cuddling with an outdoor cat with razor sharp claws poses a few challenges! Ouch! 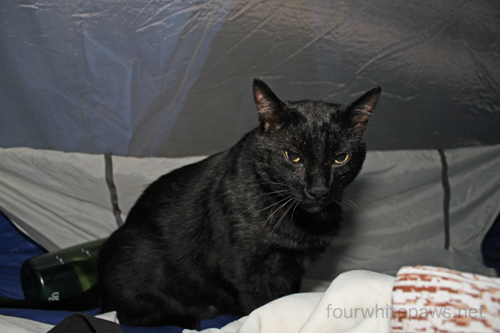 I think Oliver likes camping! 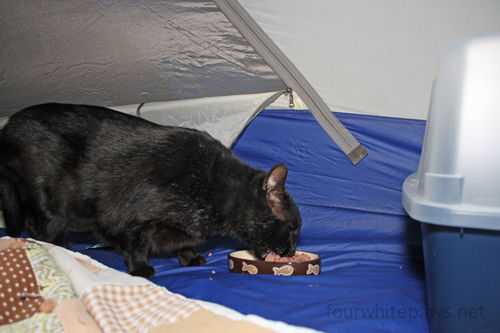 I love that Oliver purred the entire time in the tent. 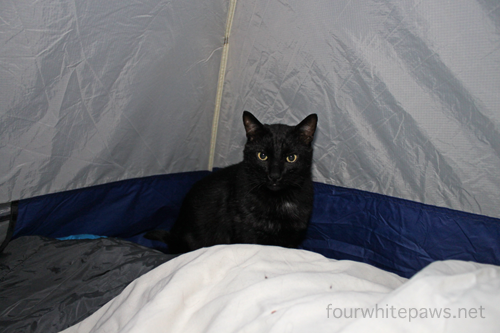 He didn't view the tent as a prison, but a fun place to cuddle and be with his human. I adore this boy and so wish he could be an inside cat and give up his tough, territorial nature, but his non-stop urine marking makes that undoable. 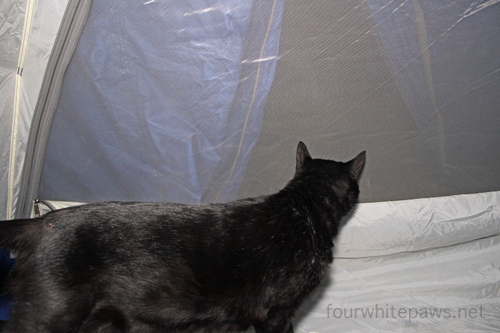 Thankfully, he didn't spray in the tent! 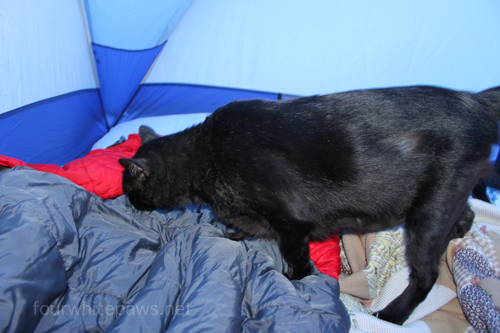 We'll have to try this again, but next time I need to remember to pack the kitty toys! 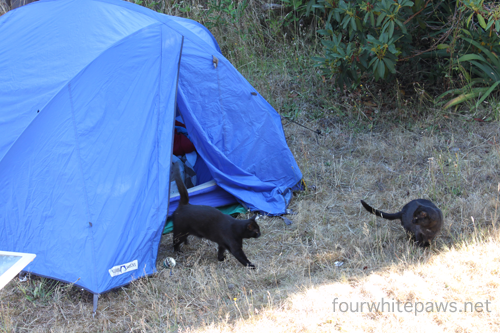 Camping outside in a tent with cats is a new one on me. At least you get away from the heat from going out there at night! 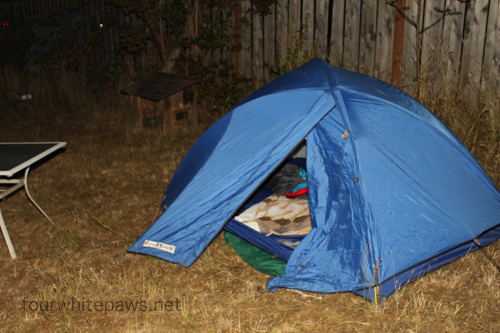 What a cool idea to camp in the garden with your cat! Oh I wish there was a good solution for your dear Oliver. You really are a good Kitty Dad to Oliver and all the kitties! That was a very clever idea and no doubt Oliver will be looking for the big blue fort from now on! What a great cat dad!!!!! 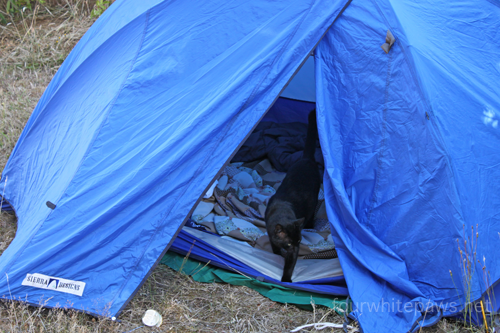 What a brilliant idea to have a camp-out.....and it WORKED! omg what a blast!!! I love that idea!! I want to come over and camp too! You two make my heart sing. This looks like so much fun. What a great idea.